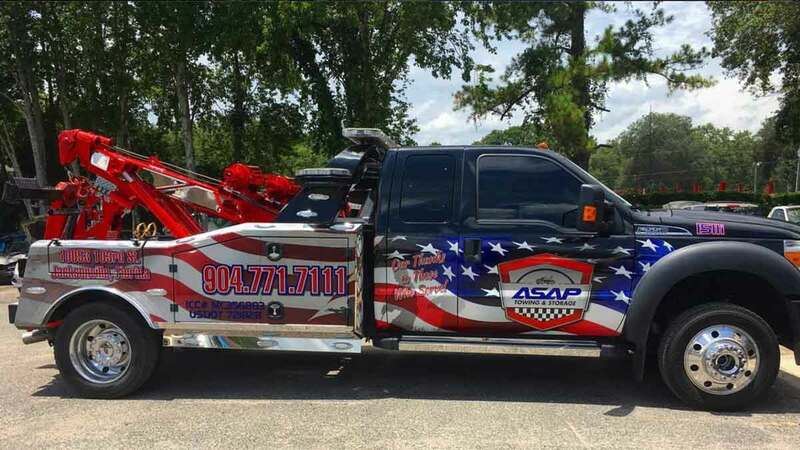 Local towing company, ASAP Towing & Storage is your source for fast, affordable, local towing in Jacksonville, St. Augustine and along I-95, I-10, US 1 and US 17 in Duval County, St. Johns County and Clay County. Our light duty flatbed tow trucks and wreckers are operated by skilled and Wreckmaster certified operators who are prepared to solve your emergency towing or recovery challenge anytime – 24/7/365. We also provide lot storage services for cars, trucks, buses, construction vehicles, RVs, boats and more. Call 904-771-7111 now to get a truck dispatched to your location. 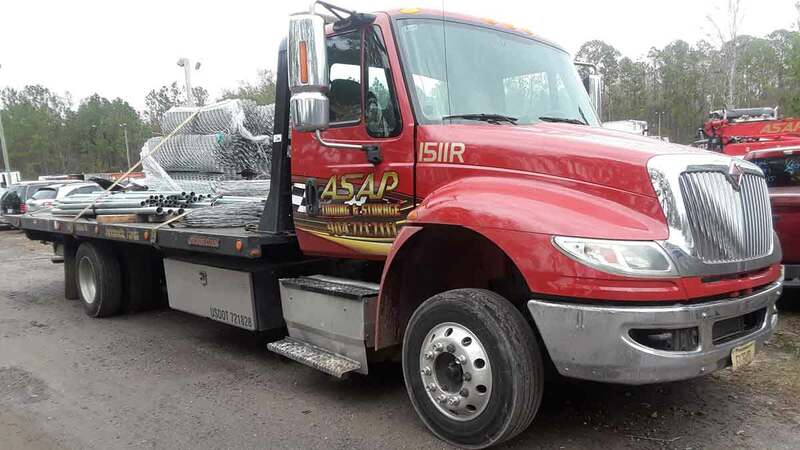 ASAP Towing & Storage provides immediate response towing throughout Jacksonville, St. Augustine and along I-10 and I-95. As the biggest towing company in NE Florida, our fast and affordable towing services provide trucks throughout the area and can immediately respond with the truck closest to you. From a quick winch out when you’re stuck in the sand to luxury vehicle towing, ASAP offers fast, professional services along with access to 5 secure impound lots. Our local towing services include: Car Towing; Light Duty Towing; Flatbed Towing; Motorcycle Towing; Truck Towing, Antique Car Hauling; and Emergency Towing. ASAP is proud to serve those who serve our country – we have access to all Jacksonville military bases and can provide military towing and roadside services at NAS Jacksonville and Naval Station Mayport. If you are stationed on a naval base and need towing services, give us a call at 904-771-7111 for your towing needs. 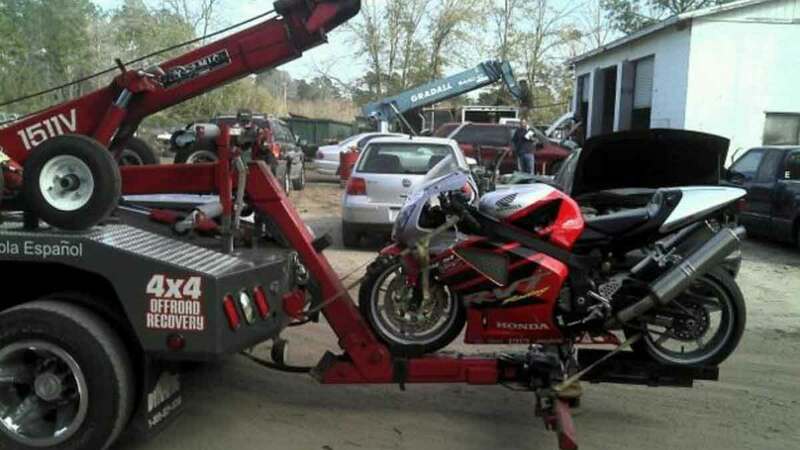 ASAP Towing & Storage offers fast and affordable motorcycle towing throughout Jacksonville, St. Augustine and the surrounding area. We understand just how important your bike is to you and are committed to quality, safe and affordable motorcycle towing. We have decades of experience in motorcycle towing and take every precaution to ensure your motorcycle is safely transported. Our operators are experienced in securing motorcycles using our flatbed trucks and special locks and straps to ensure your bike has a safe and smooth ride. By keeping our equipment and motorcycle knowledge up-to-date, we are able to provide excellent services for not only your four-wheeled vehicles, but those two and three-wheeled babies as well! Call our dispatch center now at 904-771-7111. ASAP Towing & Storage has experience with off road recovery including accident towing and recovery. We can also provide a winch-out for vehicles that are stuck in the sand along any of the First Coast beaches. With over 200 years of towing and recovery experience on staff and a fleet of late model towing equipment, we are prepared to solve your recovery issue as quickly as safety allows.